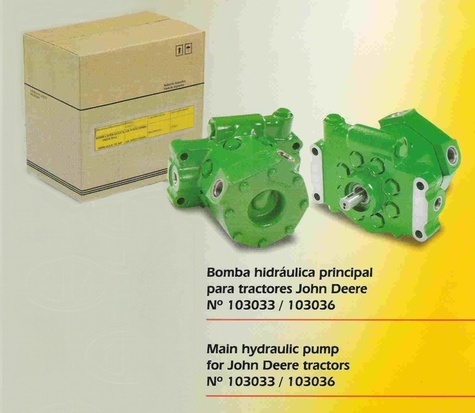 We manufacture John Deere hydraulic pumps and parts. Our pumps are 100% totally new and our quality is OEM as we supply in south America assembly tractor plant. Cant be compared with a remanufactured pump as the body of a used pump will never give same performance. This is used on models John Deere 840, 940, 1020, 1030, 1040, 1120, 1130, 1140, 1350, 1550, 1630, 1640, 1750, 1830, 1840, 1850, 1950, 2020, 2030, 2040, 2040s, 2120, 2130, 2140, 2150, 2155, 2240, 2250, 2255, 2350, 2355, 2440, 2450, 2550, 2555, 2640, 2650, 2750, 2755, 2840, 2850, 2855, 3030, 3040, 3050, 3120, 3130, 3140, 3350, 3640, and 3650. This replaces John Deere part number AR103033 AR39167 AR103035 AR103036 AR89064 AR89061 AR39168 AR39019. other pumps and all type of parts for john deere are available.